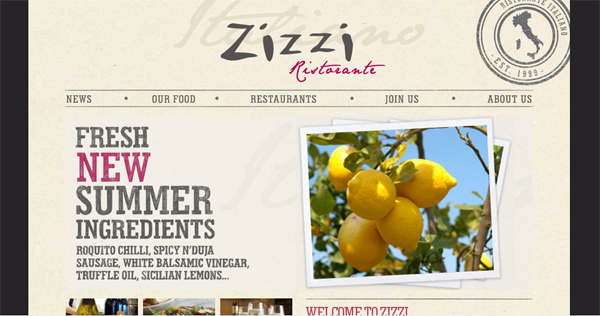 It is common knowledge within the design world that most restaurant websites are terrible. 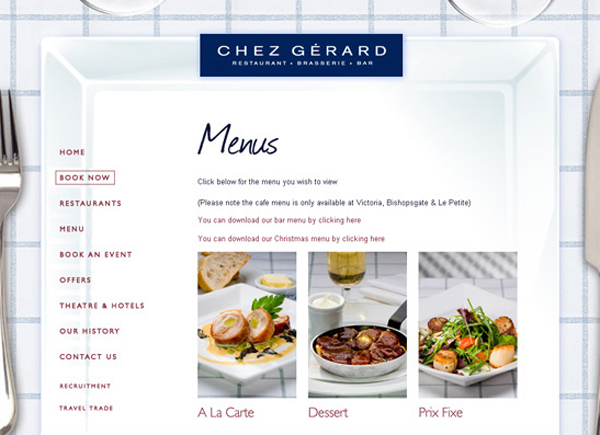 For this post I have compiled a selection of the best restaurant websites around. Simple, modern and clean, this website utilizes a minimal colour scheme to keep things fresh. The appealing elements of this website is the font choice and the structured layout. Everything is spaced out well and clear and the illustrations are a nice feature. The colour scheme doesn’t really scream GREEK to me, but other than that it is a nice job! This design is a concept I found on deviant art. 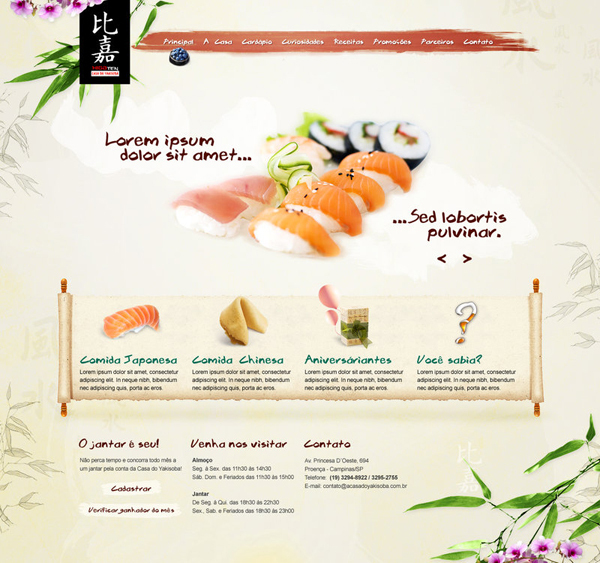 Any sushi restaurant would be lucky to have this design as their website! Clean, good colour scheme and a great use of images. It almost makes me want to like sushi! 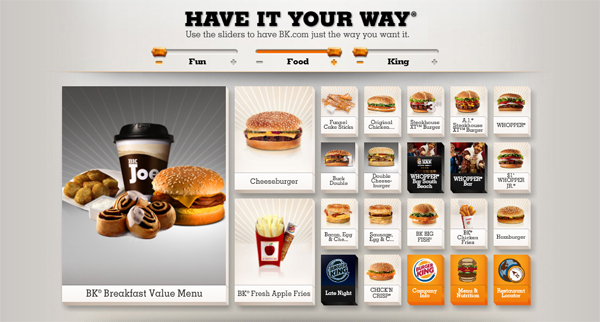 The design for burger king is pretty non existent, but I found the concept quite interesting. You can use the sliders to alter the page depending on what you want to see. For example, if you want to see more details about their food, or about latest offers, you just simply drag the sliders to your satisfaction! This website is something different. The use of the plate and cutlery as the background is a nice element but the layout on every page could benefit from an overhaul. Overall, an eye catching design! The main image on this website is great! A nice selection of food with amazing colours a nice perspective, but…it is just simply too big! The rest of the website just gets lost beneath it. Everything looks delicious though! The purple and grey colour scheme works well and looks modern, however it doesn’t really say Italian dining to me. The logo is really nice, and the layout is simple yet effective. I particularly like the grainyness of the background contrasted with the dark grey. 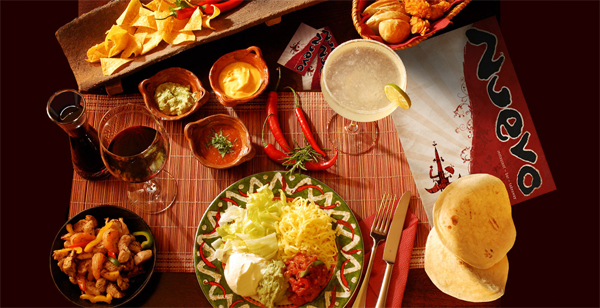 This website is the only restaurant site I came across with a full page image. The website itself is a nice design yet a little overwhelming. 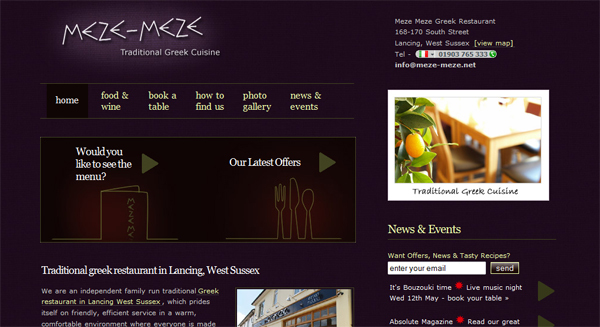 I think this layout would have been better suited to an interior design website rather than a restaurant. The design of this website is fresh and modern. The menu with corresponding icons is a feature I have not seen in the other websites and I think this attention to detail is what sets it apart from the others. The website is up-to-date with social networking intergration and the layout is well organized. The main image is a little on the large side, causing more scrolling than is necessary. The white and blue colour scheme creates a modern yet effective design. The use of images adds depth to this otherwise minimal website. The layout is well structured and it was a good idea to put the different sections such as “Find your nearest Carluccio’s” or “Dates for your diary” immediately on the homepage!